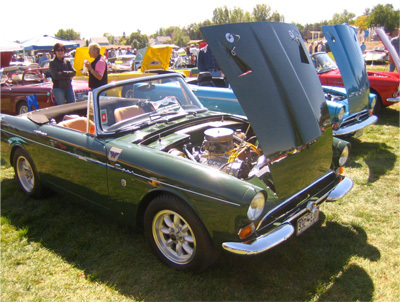 In late 1975 a few enthusiastic Colorado Sunbeam Tiger owners came up with the idea that like other British car owners a club might be fun and bring together owners with common interests and to share information. Don Perez and Darrel Beachy put together flyers to put on the windshields of any Tiger they spotted and also put ads in the local press. On November 4, 1975 the first gathering of Tiger owners was held at Charlie O's restaurant in Lakewood to discuss the possibility of forming a Colorado region of Tiger owners. There were 13 owners present and 7 Sunbeam Tigers. Various literature, catalogs, slides and pictures were brought and shared around. It was unanimously agreed that an official club should be organized. A meeting date in December was set to start the process of determining the name, dues, officers, etc. In the next few meetings the name Colorado Association of Tiger Owners (C.A.T.O.) was adopted and incorporated in the State of Colorado and the first officers were elected. They were Don Perez, President, Darrel Beachy Vice President, Steve Berry, Treasurer and John Tomasiewicz, Secretary. Monthly meetings were planned for the 3rd Wednesday of every month. Dues were set at $2.00. Barbara Beachy designed the club logo. Other members that first year in addition to the above officers included Terry Rice, Dave McDermott, Larry Burrows, Glen Nicholls, Dave Murray, Bob French, John Markel, William Bell, Steve Goldman, Mike Healy, Jim McGregor Gerald Feder George Gettle, Jim Baer, George Berry, Mike Finley and Terry Smith. Several of those original members are still active in CATO. The first club caravan and picnic was held on June 12, 1976 and 8 Tigers participated along with a few more members in other cars. Several more family picnics and caravans were held that first year. The club started a program to supply parts for members. In some cases if the part was not available elsewhere and if there was enough demand, the club fabricated the part locally. By the end of the first year the club had 30 members. During the next few years the club added other activities such as autocrosses, fix ins, guest speakers at meetings, a Holiday party, a tech tip column and want ads in the newsletter etc. For example, in the June 1977 issue of the newsletter a MKII Tiger was advertised for $2,300. Dues were increased to $5.00 per year. The club held the first Tiger Vail I event in Vail on July 7, 8 and 9 at the Kiandra Lodge. Many Tiger owners attended from across the United States including Ian Garrard, the father of the Tiger and his wife Laura. Ian was the main speaker at the banquet. In 1978 Dave McDermott was elected President, Doug Bullard as Vice President, Terry Rice as Editor and Larry and Patti Burrows as Treasurer. After the success of Tiger Vail I a second Tiger Vail II was held on July 6, 7 and 8 again at the Kiandra Lodge. Ian and Laura Garrad attended again which was a real treat for any Tiger owner. The #55 Hollywood Tiger was towed all the way from the east coast and attendees were treated to a talk by Doanne Spencer explaining the intricacies of that famous race car that he built. A new addition to the event was an autocross using the identical Malibu Grand Prix cars which even Ian and Laura Garrad tried out. From these early foundations CATO has prospered through the years and continues to bring together Sunbeam Tiger enthusiasts in Colorado.